Read it with utter devotion. And these are totally different from body lotion. Only for face you see. The precise count is three. Followed by some circular movement of fingers on cheeks. Trust me, it's a fine technique. To dress my gorgeous eyes. Where the whole universe lies. Two minutes are never enough. I will hand over your dream wife to you. Your wife, not some fast food. 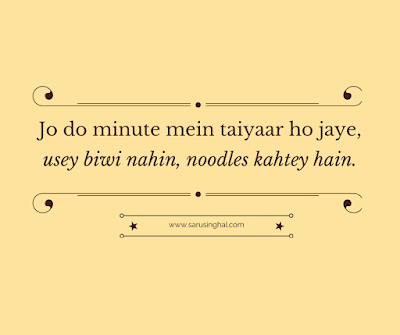 P. S. - Jo do minute mein taiyaar ho jaye, usey biwi nahin, noodles kahtey hain. @Alok - Glad you admitted that you are at fault, ALWAYS! @Binu - Hahaha... All you guys are on a mission, it seems. That tagline you're using is brilliant. I had all my teeth out while reading your post. Saru, i agree with you...it definitely takes more than 2 mins..
Wah wah ..kya khoob Saru, Now it is difficult to say who has a better sense of humour - you or Alok. Guess, there should be a competition. Such a cute and funny poem! It made me grin from ear to ear. You have managed to write the utter truth of every woman's life in such wonderful lines. hahaha Alok ne kya kar diya? You know I am the same lipgloss and kajal person. And, yet I always hear jaldi karo. Ha ha - very sweet! Heheehehe....so well said Saru.... :-D :-D Alok, are you listening? Ha ha ha.. Alok.. Got it? 2 minute ke 20 minutes kabhi accept nahin honge! haaa haaaa loved it absolutely!!!! But my mother is capable of getting ready in two minutes :O I don't know how she manages to! Good for you and yes, I don't know how our mothers managed. 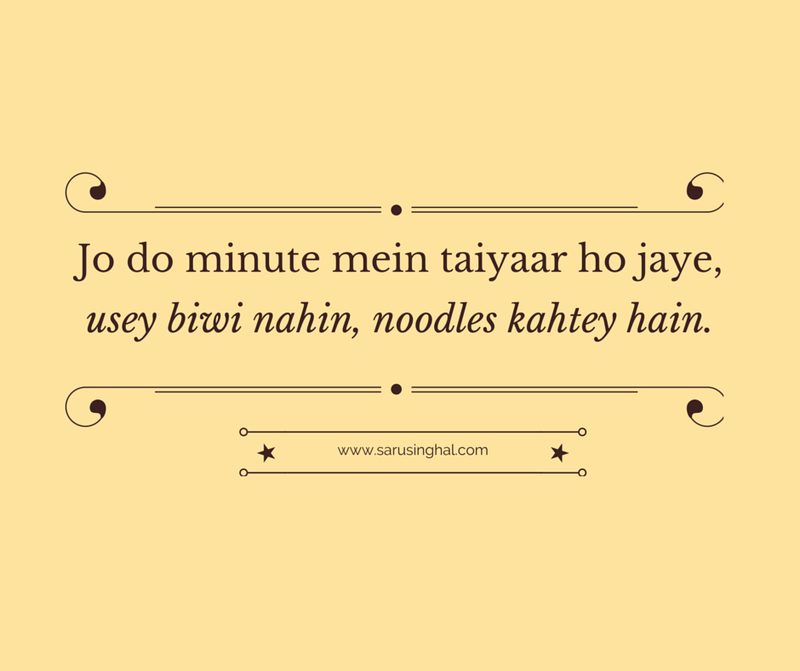 Hahahaa, biwi hoon, noodles nahi.. too much!! The best I've read today. You always bring in something so good. Made my day :P just loved it. Bwahahahaha Alok. This is super Saru :P.